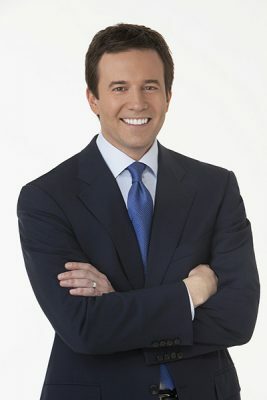 “CBS Evening News” anchor Jeff Glor ’97 will deliver the keynote address at the Convocation Ceremony for the S.I. Newhouse School of Public Communications on May 12 at 12:30 p.m. at the Carrier Dome. The event will be livestreamed at http://commencement.syr.edu/livestream. Glor, an Emmy award winner and veteran CBS News journalist, was named anchor of the “CBS Evening News” in October 2017, and began his tenure at the helm of the broadcast Dec. 4, 2017. Glor joined CBS News in 2007 and has traveled around the world to bring original reporting to viewers. He has covered some of the biggest breaking news stories of the last decade, including the shootings at Sandy Hook, the Boston Marathon bombings and the landfall of Superstorm Sandy. Glor recently led the network’s on-the-ground coverage of Hurricane Irma in Florida, as well as the Manhattan terror attack by truck and the mass shooting at a church in Sutherland Springs, Texas. Glor was a lead anchor on CBSN, CBS News’ 24/7 streaming news service, during its critical launch period. He has served as a correspondent for “CBS This Morning” and “60 Minutes Sports,” and as anchor of the weekend editions of the “CBS Evening News” on Saturday from 2009-2010 and Sunday from 2012-2016. He also anchored “The Early Show” in 2011. Before joining CBS News, Glor was the weekend evening news anchor and a weekday reporter for WHDH-TV Boston. He began his journalism career at Syracuse’s WSTM-TV, and was named “Best Male News Anchor” by the Syracuse New Times. He earned a dual degree in broadcast and digital journalism from the Newhouse School and economics from the Maxwell School of Citizenship and Public Affairs. For more information about the Newhouse School Convocation Ceremony, contact Susan Nash at 315.443.5007 or sknash@syr.edu. More information about Syracuse University Commencement Weekend may be found online at http://commencement.syr.edu.